Prawns fed with Novacq are more sustainable and a top quality product. 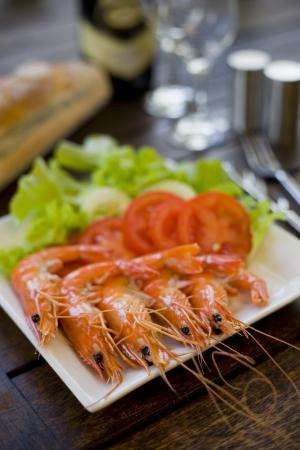 Australian researchers have developed a food additive for farmed prawns that will mean prawn lovers will have access to more sustainable prawns that still taste great. After 10 years of research, CSIRO scientists have perfected the Novacq prawn feed additive. Farmed prawns fed with Novacq grow on average 30 per cent faster, are healthier and can be produced with no fish products in their diet, a world-first achievement in sustainability. CSIRO's Dr Nigel Preston has been working with the A$75 million Australian prawn farming industry for over 25 years, and says this is a game changer for the industry. "We fed Novacq to black tiger prawns, and it made them even better for consumers, the environment and prawn farmers," Dr Preston said. "This is a major achievement for the sustainability of Australia's aquaculture industry as prawns fed this diet are not only a top quality product and reach market size faster, they also no longer need to be fed with any products from wild fishery resources." "This means that Australian prawn aquaculture, already a world leader in sustainability and environmental management, is now set to become even better, and really solidifies aquaculture as a sustainable source of protein to help meet the ever growing demand for food." Until now, Australian prawn farmers have needed to feed their prawns with a pellet that includes some sustainably sourced fish meal or fish oil, in order to ensure that the prawns grew fast, and were a healthy and high quality product for consumers. "When we are talking about relieving pressure on our ocean stocks of fish, every little bit helps. Novacq will mean that the Australian prawn farming industry could potentially no longer be reliant on wild-caught fishery products," Dr Preston said. CSIRO and Australian owned and based Ridley AgriProducts have announced that Ridley AgriProducts has taken a licence to produce and distribute Novacq in Australia and several South-East Asian countries. Mr Bob Harvey, General Manager Aquafeed from Ridley AgriProducts said this means the Australian industry will soon have the opportunity to use the Novacq feed additive to boost domestic prawn farm productivity. "We've seen this product in action and we know how great it is. We've conducted multiple laboratory-based trials, and in conjunction with CSIRO and a great customer of ours, Australian Prawn Farms, we have proven the effects of Novacq when commercially grown, added into a commercial prawn feed and fed to black tiger prawns in multiple full-scale commercial sized ponds," Mr Harvey said. "Adding Novacq into even the best performing prawn diets on the market, we proved a significant incremental growth rate and food conversion rate improvement. "We are really excited to now be able to start the process of commercialising Novacq, so that Australian prawn farmers will soon be able to benefit from it. Over the next twelve months we will be upscaling production, performing additional tests and further farm-scale trials, and then to move into full-scale commercial production." The effectiveness of Novacq has already been demonstrated on one Australian prawn farm, with Mr Matt West, Operations Manager of Australian Prawn Farms based at Ilbilbie in Northern Queensland, getting a chance to see the results over a period of four months testing the feed additive on black tiger prawns. "What I saw on my farm was a clear incremental growth compared to the high quality diets that were used as a control for the large-scale trials we recently conducted at our farm," Mr West said. "Apart from the improved growth rate I observed, what is really exciting to me about Novacq is the very real possibility for Ridley to ultimately be able to produce a great performing prawn feed without using any marine sourced proteins in the diet. This will, of course, mean an even more sustainably produced prawn crop being farmed at Australian Prawn Farms." Novacq is an entirely natural food source based on the smallest organisms in the marine environment, the marine microbes which are the foundation of the marine food pyramid. It is based on over 10 years of CSIRO research to understand the natural marine microbial processes that occur in prawn farm ponds and natural marine estuaries, and the role of microbes in prawn nutrition. Production of Novacq relies on the controlled production of these marine microbes. CSIRO researchers have discovered how to feed and harvest them, and convert them into a product that can then be added to feeds as a bioactive ingredient, like a dietary supplement for prawns. Including Novacq in the diet of farmed prawns has shown for the first time that fish meal and fish oil can be completely replaced in the prawn diet, potentially freeing the prawn aquaculture industry from reliance on wild fishery resources. CSIRO has substantiated this through dozens of tests over the past five years, both in Australia and throughout Asia. These results will be presented today at the 2013 Ridley AquaFeed Australian Prawn and Barramundi Farmers Conference in Queensland. Is this the perfect prawn?